Gold-tone stainless steel case with a gold-tone stainless steel bracelet. Fixed gold-tone stainless steel bezel. White mother of pearl dial with gold-tone hands and index hour markers. Dial Type: Analog. Luminescent hands. Date display at the 3 o'clock position. Small second subdial. Citizen Caliber Eco-Drive B690 eco-drive movement. Scratch resistant mineral crystal. Solid case back. Round case shape. Case size: 36 mm. Fold over clasp. Water resistant at 100 meters / 330 feet. Functions: date, hour, minute, small second, solar-powered. Casual watch style. Watch label: Japan Movt. 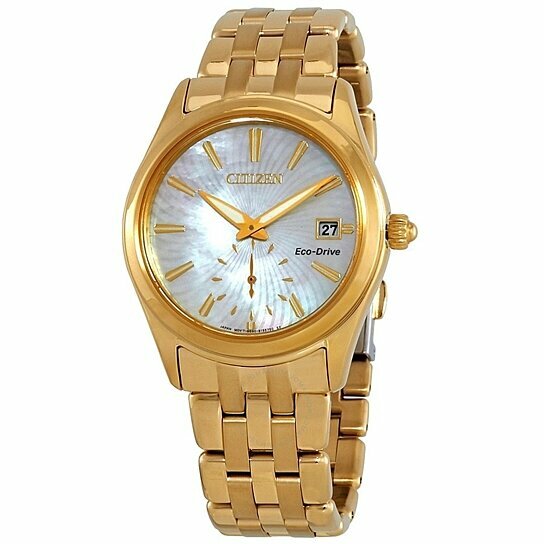 Citizen Corso White Mother of Pearl Dial Ladies Watch EV1032-51D.